Longee has an almost unassailable lead in the Uglybustards tipping ladder competition. With five games to go, he leads by 4, and would need at least 4 upsets to go against his tips to lose. I don't think Griggsy would risk his second place to go after him at this stage. Although he put up a good campaign in his Premiership defence, it looks like he will have to face the pain of runner-up this year. The battle for third is just getting hotter each week, with powerful and Craig Nettlebeck storming back into contention now level on points with Uglybustard in a 3-way battle for the podium. The margin comp appears to be back to a 2-horse race, with Uglybustard and Rod Carter just 1 and 7 points off the margin respectively and less than 2 goals separating them, while David Feck'Em slipped to over 5 goals off the lead, but still in with a slim chance for the title. The jackpot went to Iain Johnson this week who picked the perfect round - the exact margin and 4 wins from 4 games. Sensational stuff, pity he's left his run a bit late and more's the pity he only pockets $5 for his work. The Trivia Comp has been decided for 2012. Uglybustard took the title on 199 with a round remaining, Rotten Ronnie Andrews was runner-up on 190, and third place went to Griggsy on 186, who just couldnt quite catch Ronnie. Uglybustard takes home the porsche, the round the world trip and a night out with Elle. 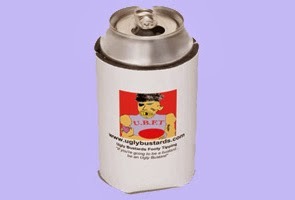 Rotten Ronnie wins an Uglybustards T-shirt, I assume that will be a large Rotten? Griggsy gets the Uglybustards Executive Pen, as per the Prizes page. * This spot prize is open to all Uglybustards Tipsters. Previous winners are eligible. Those who did not enter the Prize Pool are eligible. Uglybustard's decision is final. No correspondence will be entered into.